More than 40 people were injured, and at least four have died in Mississippi after a charter bus was struck by a train. It took more than an hour for the passengers to be removed from the heavily damaged bus, and rescuers had to cut through the frame of the bus to reach the last two. 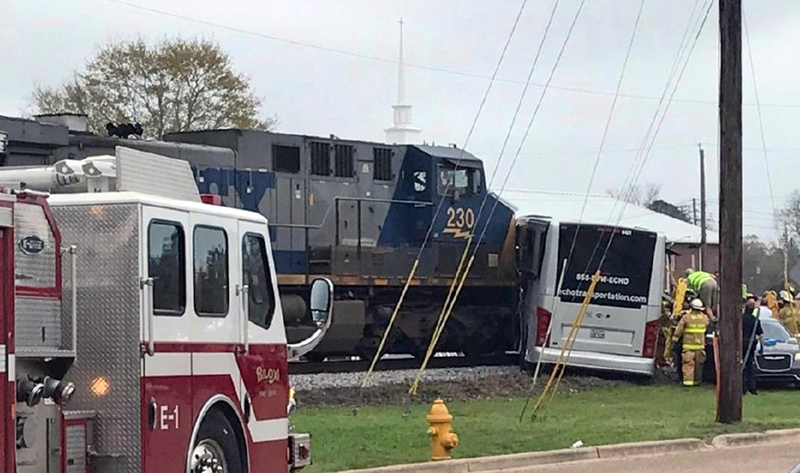 Officials are unsure of why the accident occurred, but the scene depicts the bus was stopped on the tracks before being slammed into by the 52-car train and pushed more than 300 feet down the track. Biloxi Police Chief John Miller said it was unknown if mechanical issues were at the root of the crash. The bus was transporting passengers from Austin Texas to one of eight Biloxi casinos, a trip organized by a senior center in Texas. Witnesses said they knew what happened when they heard the loud booming collision. They said the bus was apparently on the tracks for five minutes or so before being hit by the train. At least one witness was reported as saying that people were getting off the bus as the driver continued to try to move it, and at least one person went under the bus when it was struck. People used a car as a stepladder and rescuers were pulling passengers from the bus through the windows. At least 48 people were on the bus. A triage area was established quickly by nearby hospital workers, though some passengers were flown by helicopters to other medical facilities. About 10 trains typically use the track every day, traveling at a maximum speed of 45 m.p.h. Records from the Federal Railroad Agency show that the rail crossing has been the scene of 16 accidents over the past 40 years, two of which involved fatalities. The crossing is on an embankment, and though it has warning lights, crossing arms, bells, and warning signs to alert drivers to low ground clearance, some residents feel it’s just too steep to be safe. Three investigators from the Federal Railroad Administration and one from Mississippi will be investigating the crash along with the National Transportation Safety Board.